-Support for Rebellion and maybe older expansions. -Exports to the BIN format. Imports both BIN and TXT models. -Much, much more improved mesh processing. -'Tangent map problems' fix. This was an error with vertex normals that weren't being flipped when the model was. -Add model flipping on export so modeling in max is more natural. -Import points too, so far its just importing the mesh. Like with the old tool, run 'SinsOfASolarEmpire_Rebellion.ms' from the utilities tab and it should appear in the dropdown box. Mesh as normal. Multi material works by applying max materials to the faces you want them on. Instead of dummies for points you'll have to apply a skin modifier and use bones. See below for more info. Instead of dummy objects the script now uses bones. Create the bones with the correct orientation and place them where you want. Name them as required by the game. Apply a skin modifier to the ship object and add all the bones to it. Since the gamemesh processor takes smoothing groups into account when generating vertex normals you can use smoothing groups. 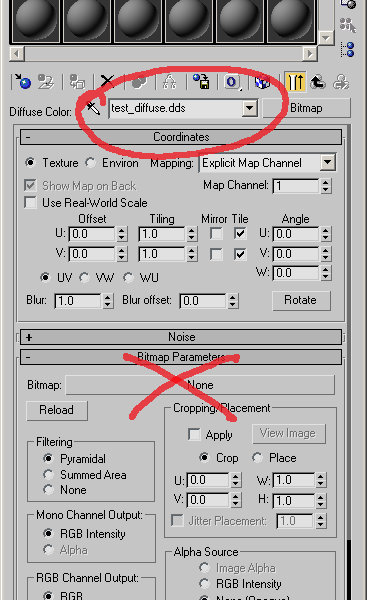 If you're using smoothing groups make sure the utility you're using to bake normals also supports them. GameMesh is a max object preprocessor that calculates pretty much anything about models. It supports overly complex model setups, multiple materials, bone hierarchies for animated models, etc. It even takes smoothing groups into account! Should work with most max versions since this is a maxscript tool, not a compiled one. Unzip the contents of the zip into your 3dsmax\scripts\ directory. -Use dummy objects for points, rotate them so they face in the direction you want. -Link them to the main object. If you don't link them they will not be exported. What version of max does this support? I have tried it on Max 5 and Max 7 and I get the same thing... a Runtime Error. --Runtime error: fileIn: can't open file - "help.ms"
Forgot to add a generic helper script file into the mzp. Redownload the file, should work now. Sweet, I will have to give this a try. This is excellent because 3dsmax is my weapon of choice for modeling (many others too). I use 3dsmax version 6. Ill give this script a try later. However you should specify which version/s this script is intended for. Guys you still may need Softimage to set the tangents in the models correctly. If anyone figures out a work around in Max or Lightwave it would be greatly appreciated. 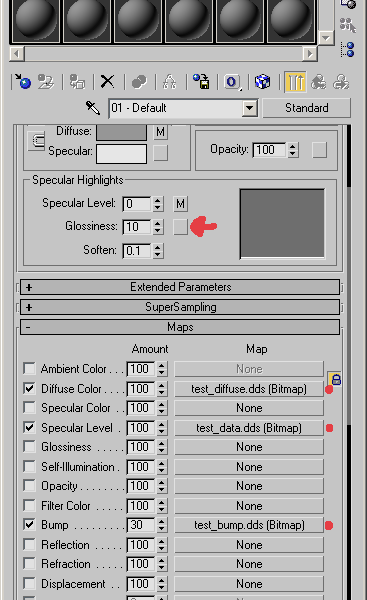 The "Tangents" seem to be a proprietary softimage thing that tells the models how to use its shaders correctly in game. I hope i am wrong. I don't have 3ds max and I'm no 3d-modeller, but there's nothing "proprietary" about tangents. I won't try to explain it because it still kinda confuses me myself. In the end the tangents and the normal define an orthonormal basis, which corresponds to texture coordinates. This allows us to store normalmaps in "tangent-space" and reuse those normalmaps on different objects (or a different part of the same object), so the (main) point behind all this tangent stuff is saving texture memory. *edit* @Stannum: Your nick looks familiar. Are you also contributing to "Infinity" ? It should work with 3dsmax r6. As far as I know I'm not using any max 7/8/9/2008 specific functions. If you do run into anything please post it and I'll try to find a work around. As FleischWesen said, tangents aren't something specific to xsi. A tangent is part of the vertex normal (normal, tangent, binormal/bitangent) basically it's just a bunch of orientation vectors (x,y,z) for the vertex so that you can use tangent space normal maps. If you know the vertex normals for a triangle you can calculate the normals for a specific point on that triangle (per-pixel shader stuff) Together with the vertex normals and the normalmap normals you get a new vector for the fancy lighting. It isn't hard to calculate all the vertex normals, it's just a bunch of vector calculus. FleischWesen: Yes, I'm the same Stannum as on the infinity boards. It works with My version of Max 5 so it should work with 6, especially being that its a script and not an importer. you did great work, and cant wait to try your export feature out. It works! the ability points seem messed up (all above the mesh), but the model itself imported nicely. I learned that Sins doesnt use any separate LOD (level of detail) meshes. Can the dev's clue us in if meshes auto lod, or not? Anyways NICELY done! We will be keeping an eye on this one. Edit: It seems the UVs dont import right as well. Texture comes out all messed up on model. Just an fyi if you didnt already know This is still a good tool because i learned some valuable info needed for my mod. talking to Tristan he said no lods are used. Now I've picked up the XSI mod tool to get familiar with it, the important point to make here is that the xsi mod tool is free, you don't have the have other apps to use it. It is a learning curve even if you've used other packages, but I applaud star docks decision to allow a fully featured modeler (most of the other stuff is disabled in xsi) as their default pipeline because this makes it a lot easier for people to get their content in the game. That being said there may be interesting things we can do with a .mesh exporter from max that exploit functionality that may not be in the forge xsi tools . I also have most of my content in max and I am most familiar with its tools so I would like to export directly without conversion. It will certainly be nice to have a 3ds max exporter. Im more comfortable with max than XSI. I agree that it is great Ironclad/Stardock chose to use the free version of XSI. More companies who want to promote modding need to use free programs like these. That in the end makes the game last longer modding wise because the programs are free and easy to get. I know about the ability points not importing correctly. It isn't that important for importing. Which model are you getting wrong UV's with? So far I haven't had any problems with incorrect UV's. Could you check if the UV's aren't just flipped in the v axis? It was the Kol battleship. Ill retry an import. What i did was export it from max to .3ds to view it in deep exploration. I probably should have reassigned the material 1st. Its not that important to me, because i just wanted to see how the sins meshes were built, and view poly counts. Kodiak Heavy Cruiser = ? Planet modules have varying polycounts; the highest I've seen so far is over 7000 for the frigate yard. Installations seem to be about 3000-5000. I think each model (ship) has an associated shield mesh object as well. Orientation - from the importer - is to have the front of the ship facing up in 3ds max. I checked the model in max, no errors with the uv. My guess is that the uv data is lost when you export to 3ds from max. Yea it was. Sorry 'bout that. Now i know better than to export before i assign material. So basically cap ships shouldn't go above 5000 polys. 7000 is the highest poly model in the game? I would say you can make a few 10k models, but you dont want too many high poly meshes on the map at one time. I didn't check all of them (I think planets may be higher, being spheres et al), but the highest I saw was slightly over 7000. I think with bumpmaps, and considering the relative scale of what you see on screen 99% of the time, 5000 is a good max for the big ships. It seems that frigates and cruisers have similar limits, though; I guess they must be expected to be seen in roughly equal numbers. I've completed pretty much everything but the NumCachedVertexIndicesInDirection:* part. Have to figure out how to find out which direction a vector is pointing to (up/down etc) and then sort them. Check OP for more info. Sweet, I will have to give this a try when I have some models to export. will try this tonight and let you know the results. can we have an export to TXT for debugging? Looks like its something to do with the textures. Are you sure you followed the texture directions in the original post? There might be an error there like a wrong texture name or something.